The human cells are poorly represented in most of textbooks: like a soup with a nucleus in the middle, and all metabolites and proteins dispersed along it. Which means that communication and reactions are just a matter of time when two molecules meet each other and match. But that is too simplistic and only applies to bacterial organisms. A modern human model integrates a highly organized cytoskeleton (who serves as scaffolding and highway of information of every) that connects all cellular matrix from the membrane frontiers towards the nuclei. Left: red-stained cytoskeleton from a human cell, where nucleus is blue and cell membrane is green. Right: from a bovine cell, the microtubules are stained in green, nucleus is blue and actin filaments are red. Click here to see the source of both images from above: left image, right image. A kinesin is a motor protein found in eukaryotic cells. As shown in this popular video of a kinesin protein transporting a vesicle, we can see how kinesins move along microtubule filaments, using the cytoskeleton literally as the road from the nucleus towards the cell membrane. In 2011, Simone Köhler and colleagues published Collective Dynamics of Active Cytoskeletal Networks, where it is described how self organization mechanisms are essential for the cytoskeleton to adapt to the circumstances. The cytoskeleton filaments were exhibiting pulsatile collective dynamics and transport properties. The hyperlink above takes you to the article and also towards the source of the GIF image below. Very importantly, this cytoskeleton crosses the cell membrane, so it is making a continuum towards the extracellular level and the connective tissue system. This continuity is extended to every corner of our bodies. The Living Matrix is the term accurately used by Dr. James Oschman, who is a researcher and author of one of the few scientific books available on Energy Medicine. This living matrix is composed of connective tissue, cytoskeletons, nuclear matrix and water molecules. It is the sum of thousands of fibrous pathways made of polymers, each one of the fibers is surrounded by a layer of water. And its mechanism and functionality could be described as a continuous semiconductor vibratory biopolymer network. This global network, starting from the intranuclear, crossing the intracellular and then reaching extracellullar levels, has: mechanical (sound and pressure), electromagnetic and energetic conductance. It is a very refined, highly dynamic sofisticated architecture, which not only does support and structure, but also sends and receives information. 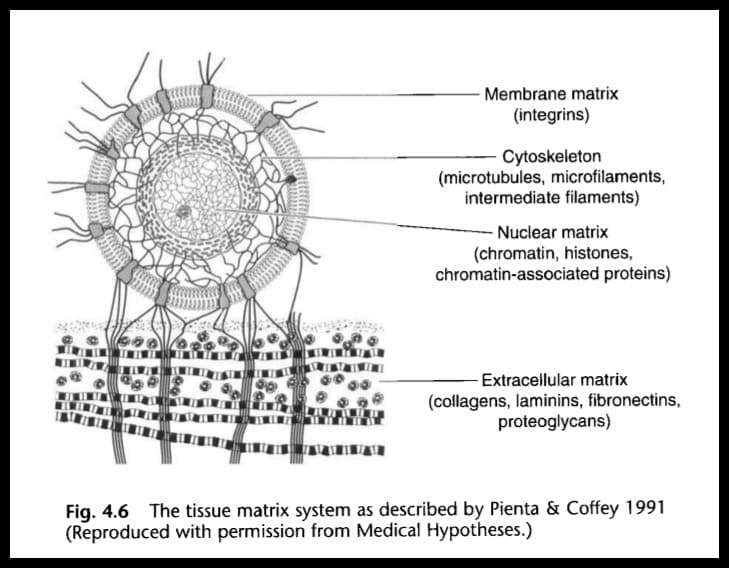 Or as Pienta and Coffey described the tissue matrix system: simultaneously a mechanical, vibrational, energetic, electronic, and informational network. UK, 1998. Mae–Wan Ho and David Knight publish The Acupuncture System and the Liquid Crystalline Collagen Fibers of the Connective Tissues. They found a common anatomical basis, which is described as: an aligned, collagen liquid crystalline continuum in the connective tissues with a layer of bound water supporting semiconduction of protons, functioning as a coherent whole. It is even interpreted by the authors as a “body consciousness”, compared to “brain consciousness”. Normal liquids have no molecular order, but liquid crystals have orientational order; and unlike solid crystals, they are flexible, malleable and responsive. Also, they keep the piezoelectric properties that normal crystals possess. Liquid crystals have the capacity to undergo rapid changes in orientation or phase transitions when exposed to electric and magnetic fields. This is a feature that has been widely used in display screens. But this is key and very important: liquid crystals also respond to temperature (semiconduction). The electrical properties of collagen depend to a large extent on the bound water molecules. Aproximately 50-60% of intracellular water is bound to the filaments, tubules and proteins that compose the cytoskeleton (this layout is also known microtrabecular lattice). This gives the cell a “solid-state” characteristic, which supports rapid conduction of positive charges. 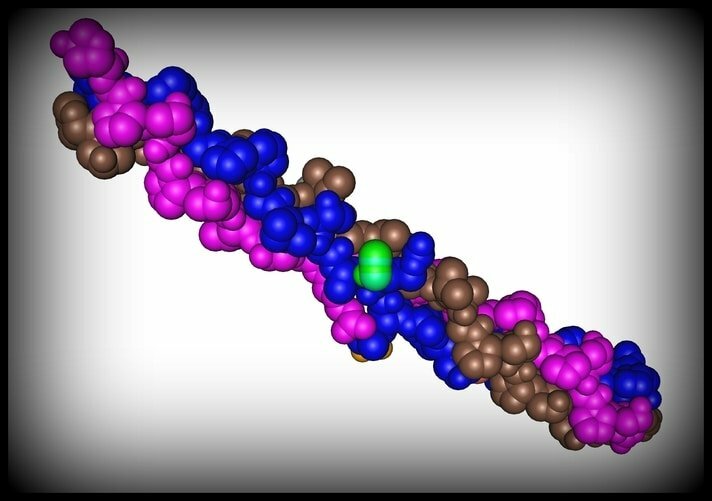 Regarding the mechanic properties of collagen, an analysis made from researchers at both MIT and Max Plack Institute has concluded that “adding even small amounts of water to, or removing water from, collagen in tendons can generate surprisingly strong forces, as much as 300 times stronger than the forces generated by muscles”. Curiosly, the addition of water causes some parts of the molecule extend and others to shrink; but in overall terms, the whole structure shrinks when retrieving water. Go here to read about the Electromagnetic Human Field, and here to read about Semiconduction and Tensegrity.